Some family friends gave my mom these gorgeous pomegranates that they grew organically in their yard. The seeds were so pretty, I had to take a picture of them before I dipped in. I didn’t think to photograph them whole though. The internet says we need to eat the seeds within three days of opening the pomegranates, if refrigerated. Or keep them longer by freezing them in single layers on a cookie sheet. The freezing option was too much for me so I set a goal to finish them in said three days, by adding them to my salads. My four-year-old niece has recently been rejecting fruits and vegetables, so I told her that these were candy, which is kind of true, since they’re super sweet. She still wouldn’t eat them, but she happily pretended to be my mom and fed them to me. Well, I missed my three day goal but I did finish them in four days. Yay for pomegranates! Ah! I’m SO CLOSE to showing you what exactly will be ready for my next launch. My model, one of my bikini model goddesses, is coming over this weekend and it’s gonna be crazay! j/k Seriously though, we will be shooting this weekend and I’m so eager to update the shop with post-swimsuit looks. Hopefully, I’ll also be shooting some kids stuff, if my fiery little model and muse is in a good mood. If not, I’m gonna recruit your child to be my model. Not kidding. So what will we be shooting? Some comfy loungewear made of recycled fibers and wool. Here’s a pair of “jean shorts” made of recycled denim. It’s not completely sewn up here. There will be different washes like dark denim, stonewash, and perhaps some non-blue colors. It was 1996 and some friends invited me to Pajama Night at Cafe 50s in West L.A, which only happens on the last Wednesday of every night. **This is NOT an advertisement for Cafe 50’s, but a cautionary tale. ** The deal is, you show up in your pajamas and you get to eat for free. So, I wore my cutesy pastel colored fleece drawstring pajama pants that my mom made for me, and a sleep shirt. We were a large group so we waited a bit for our table, which was fine because this was fun and wacky! After we got seated, our server said that my pajamas weren’t approved because the pajamas had to be two-piece MATCHING top and bottom, which meant that I had to pay for my meal. The nerve! So, yes, there will be matching tops with these loungewear bottoms. You’re welcome. Next up, I’m not 100% sure that I’ll be offering this sweater in the shop, but I at least want to show you this toddler pullover that I made for my niece/muse. It’s completely made from recycled fibers. This still needs to be sewn together, but you can get the gist. If things go well, I may even make a matching one for myself. And maybe one for you? Would you be into it? How’s your summer? Yes, it’s still summer. But you don’t need me to tell you that autumn is around the corner. That doesn’t mean TOO much to me, as a weather spoiled SoCal gal, and like you, I do have heating in my home. But still, I’ll be launching some cozier looks for fall and winter, even as I move towards more year-round/seasonless looks overall. Do you have any thoughts on this whole seasonless fashion thing? So what will these cozier looks be like? I continue to LOVE playing with color, so I’ll have loungewear, new and unique hats and scarves, some of which are hand dyed by me, and items made of RECYCLED or organic fibers. Right now, my star garment is inspired by my two favorite and most-popular personal projects from 2015, pictured below. That’s all I’ll say about that for now, except that I’m really excited to share the finished product with you. Did you miss me? Did you even know I was gone? You NEVER notice anything about me! j/k! But yes, I just got back from a super fun trip to Taiwan (my homeland) and Thailand. I loved seeing new and familiar sites in Taiwan, and getting daily massages in Thailand. I have so many incredible pictures and videos, so here’s just a teensy glimpse into some favorite moments. I stayed in Jiaoxi, Taiwan, a charming resort town famous for its hot springs, many of which are accessible for free to the public. People get their hydrotherapy on during all hours of the day and night. For a few dollars, you can “upgrade” your hot springs experience with extra exfoliation, done by fish that eat away at your dead skin. I had no desire to try this. As you can see, it’s fun for all ages. Here’s the fishing harbor in my mom’s hometown. We went to the Gold Museum and climbed into a mining cart. The miner’s life is hard; just look at my cousin and me. My sister and my other cousin hopped in and suddenly, we were on the party train. All aboard! Choo choo! In my mind, my scarf was billowing like a superhero cape. In Thailand, we took a cooking class, which was SO fun, inspiring, and educational. Here we are, about to prepare pad thai. I’d love to share more from my trip because I could go on forever but I need to stop somewhere. Plus, I’ve got to refocus my energy on my next product launch, which is planned for June. More on that later. I’m offering free crochet and knitting lessons in LA because I’m earning teacher certifications in both crochet and knitting. Part of the certification process is that I complete some teaching hours, which is great because it gives me a chance to hang out with you and have new yarny friends. I’d love to teach one to four people at a time. I suppose more people could come, but it might be harder to see what’s going on; just something to think about. We’ll have fun so email me at amy@amyevejo.com if you’re into this! Do you hate hand washing your clothes as much as I do? I’ve never liked hand washing. The only times I’d ever done it was when I had to spot clean something. I rarely heeded the advice of clothing labels that advised anything beyond “machine wash.” Instead, I’d sometimes dry clean them, but usually I’d just throw those items into the machine with the rest of my laundry. Of course I’d at least put those items in one of those mesh delicates laundry bags; I mean, I’m not CRAZY. But that kind of garment care is hardly ideal for keeping clothes long-lasting. You’d think that a fashion obsessed retired stylist would respect her clothes more than that, but no, the time and effort of hand washing was something that I wanted no part of. That is, until I started using Soak, a rinse-free laundry detergent for delicates, sweaters, and other fine garments. Yes! Rinse-free. All you do is pour a capful into a gallon of cool water, let your garments soak for 15 minutes (you can leave it in longer if you want, so it’s cool if you forget to set your alarm), squeeze out the water, then let it dry. That’s it! You may rinse, if you want, but with the drought and all, it’s nice to know that you can save time, energy, AND water by eliminating the rinse step. It’s made of no harsh ingredients that are gentle enough to bathe in, so you don’t need to worry about ruining your hands while you do your “washing.” And on the eco-friendly topic, the bottles are made of 100% post-consumer resin and the labels are printed with plant based ink, so the packaging is completely recycleable. I still dislike old-school hand laundering, but I can handle this rinse-free version. I love this product so much that I’m 90% sure that I’ll offer it in my shop. Is this something you’d be interested in? Would it help you get past your resistance to handwashing? Let me know! Do you make New Years resolutions? I don’t think I’ve ever made one before, but I do love how a new year feels so refreshing and open for possibilities for growth and expansion. This year, I still don’t have any “resolutions” but I AM setting some intentions and goals, and being tidy is one that I’m excited about. If you’re like me with the stay-tidy intention, you’ll be pleased to know that I’ve marked down the baskets. Plus, you’ll save even more when you get them as a bundle. Check them out! Spur & Goad is a collective of entrepreneurial makers and artists, founded by Bethany Ashmun and Inga Roberts. They launched less than two months ago and they already have SO MUCH rich and fascinating content about makers, places, and people. I especially love how they share the creative process of the people they profile. I’m proud to say that I was the featured maker in one of their first blog posts. I completely forgot to share this news on my blog and email updates, because it was just before Thanksgiving and the rest of my holiday happenings. So I’m sharing it now! Inga Roberts is a dear friend and I know her as an amazing musician, but I didn’t realize that she is such a great photographer and writer. I’m so happy with our feature; she explained me better than I could explain myself. Check them out frequently because they post a few new articles each week, and follow their updates on Instagram. Who’s excited to see Star Wars: The Force Awakens? I am. I’m not even a superfan, and I still got chills typing out those first sentences. In honor of the movie’s release, here’s a piece of related Amy Eve Jo history. In 2013, I became an aunt for the first time. I felt that my soon-to-be-born niece needed a Yoda hat and robe; perhaps I was moved by the light saber classes I was taking, at that time. Although my knitting skills were rusty from not having knit for years, I was deeply motivated to knit the ensemble for her, rather than buy one. I almost dropped her that first time I held her. Apparently, she was in a phase where she’d lean back really fast, so it wasn’t my fault! I also presented my Jedi gift to her, which was based on a pattern that was way too big for a newborn. Although I had resized the pattern for the hat to fit her head properly, the ears were still too big, even for Yoda. Still, my friends and family were amused and delighted with how it came out. Even though everyone else thought the huge ears were fine, I was a little more nit picky. At that time, my knitting skills weren’t advanced enough to truly reshape the ears in a way that looked authentically Yoda, but I at least made them a little smaller, just before I had to return to San Francisco, where I was living at the time. Yoda Hat, Phase II. In these pictures, I was on the way to the airport to go back to SF. I was so sad to leave her and the rest of my family. We couldn’t pull the hat all the way down because her head was resting in her car seat. I became obsessed with my niece and I couldn’t stop knitting and crocheting garments for her. In doing so, my knit and crochet passion and skills kept growing. Ever since that Thanksgiving, I don’t think I’ve gone more than a day without knitting or crocheting. This year, I had the opportunity to knit a Yoda hat for my friend’s first baby. I created my own pattern this time, and I have to say, it looks pretty rad. I forgot to take a picture of it before wrapping my friend’s gift, except for this one, when I had my niece try on the hat, so I could get a better idea of the fit. You can’t see the hat very well because she rarely keeps anything on her head for longer than three seconds. But look how healthy and beautiful she’s grown! I’m so glad that the release of the new movie inspired me to share this part of my origin story, and I’m so grateful for Yoda and Jenevieve for helping me launch my business before I even knew that it was what I wanted. I hope you had a cheerful Thanksgiving weekend. I did. This year, I contributed to Thanksgiving dinner by babysitting my very spirited niece and muse, so that everyone else could cook. She was a hilarious handful, as usual, and tried on some toddler hats for me, so look out for those soon. I also took some casual product photos with the help of my sister and my cousin. Here’s one of favorites, when my sister, on the right, looked particularly dreamy-eyed and contemplative, because she was talking about ice cream. And the 20% store-wide sale was supposed to end Saturday night, but I’ve extended it through the end of Monday night (until midnight, PT, 12/1/15). Plus, email subscribers get an exclusive extra 15% discount, on top of the sale. Sign up! I’ve always been tickled by objects that are scaled up (huge) or scaled down (miniatures). When I was five, I loved fashion and dressing up. My big sister had Fashion Plates, which I thought was fun. But for me, I preferred the Little Van Goes Drawing Kit because it was smaller and therefore, cuter than the Fashion Plates. As for going LARGE-SCALE, I adore my long reach lighter, which looks like a gigantic match. It cracks me up. For more small and large-scale favorites, check out my “To Scale” Pinterest board. Well, more of a mini collection because I’m starting out with just two colors for now, to see if you’re as excited about these big knit scarves as I am. Every item in the shop is made with enthusiasm and love, but I gotta say, these two are my FAVORITES. The super large-scale stitches add a bit of humor in a fine luxurious merino wool. Both scarves are incredibly cozy and warming and effortless to style. They’re lofty and smooshy, like how you imagined puffy clouds would feel like, when you were a kid. Like a rain cloud, the Nimbus Scarf is gray, heavier, and thicker than the Cumulus Scarf–almost twice as thick. In stock items will ship within two business days. I have one Nimbus (gray) and two Cumulus (white) scarves in stock. My yarn suppliers are small batch manufacturers, so they need a couple of weeks to get the yarn to me, so keep in mind that if the item is backordered, you’ll receive it in two to four weeks. It’s worth the wait! For example, if you need to receive these by Christmas Eve, I recommend you order by Monday, December 1. I’d love to know what you think of these scarves. And whether you love large and small-scale stuff as much as I do. Amy Eve Jo is seven months old! This is an email I sent to subscribers on September 18, 2015. Be sure to sign up for my email list to get these types of email-only updates and offers. On the eve of the website’s seven month anniversary, last week, I decided to give it a makeover. I’m still working out some image-sizing issues but overall, I’m quite pleased with the new look. Apparently so! If you’ve connected with me on social media, you know that I crocheted a custom bikini last month. Here’s the picture I posted on Instagram. Well, I thought I’d be working on Fall and Winter stuff in September, but I’ve been getting more requests for the bikini. Such a pleasant surprise because I love making these. Next month, I’ll REALLY be moving into Fall/Winter mode. I’m excited about some new yarns I’ve been researching and playing with, which have a particular focus on repurposed or natural fibers. In next month’s email update, I expect to share some new products for the colder seasons. Until then, the best places to see me microblog is on Instagram and Facebook. I’d love to connect with you there! This is an email I sent to subscribers on August 9, 2015. Be sure to sign up for my email list to get these types of email-only updates and offers. Do you like how I’m trying to make “VESSELMANIA” a thing? 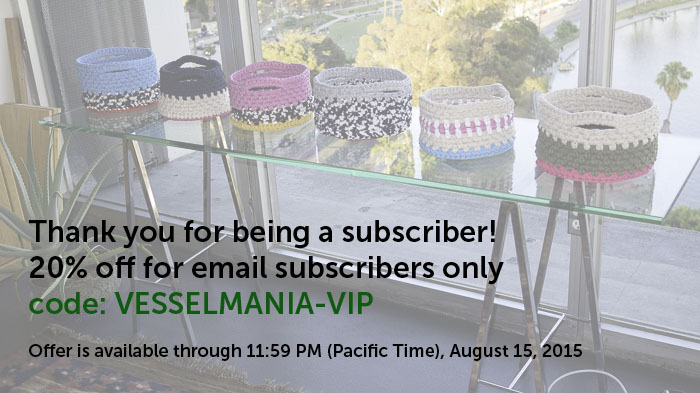 Well, to celebrate you and the launch of the baskets, I’d like to offer you 20% off, through 11:59 PM (Pacific Time), August 15, 2015.